View More In Produce - Page 3. Taste the sunshine! Sun - Maid Fruit Bits is a sweet, tart and tangy medley of fruit flavors. You'll find sweet California Raisins, tart Apples, tasty Apricots, sweet Peaches, tangy Plum and tart Cherries in every bite. These plump, peak - season fruit are carefully dried, moisturized and packed in foil-fresh zipper bags to lock-in natural goodness. Perfect sprinkled over cereal or salads. Great snack right from the bag. Bake in muffins, cookies or breads. Wonderful as a topping yogurt or ice cream. Health professionals agree that eating 5 to 9 servings of fruit and vegetables every day can be beneficial to your health. 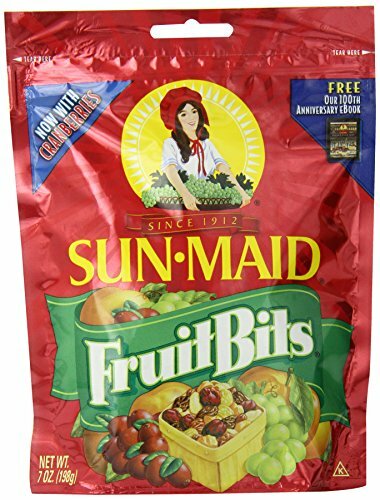 Just a quarter-cup (about 1.5 ounces) of Sun-Maid Fruit Bits provides a full serving of fruit. It's a great-tasting way to add more fiber and antioxidants to your diet. Get your 5 to 9 a day fruit and vegetables servings the fast and easy Sun-Maid way.